Ability to change (rewrite) incoming URL into a different URL based on your criteria is an essential feature for any webserver. Nginx rewrite is very powerful and flexible. Nginx Rewrite Example Using $1, $2, ..
rewrite directive is part of the ngx_http_rewrite_module module. reg-ex – This is a PCRE regular expression that you’ll specify here. This will be used to match the incoming request URI. flag – This will decide whether further process of the rewrite directives is required or not. This is explained in details in one of the examples below. 1. Nginx Rewrite Example Using $1, $2, ..
last – This flag will make sure to stop the search of rewrite directive in the current location or block and use the changed URI (i.e rewritten URI) and look for new location for any further rewrite directives that matches. *$ – This indicates the extension in the original URL. Please note that here, the extension from the original URL will be replaced by .html in the replaced URL by rewrite. So, even though you call .php in the original URL, it will only serve the .html file in the rewritten URL. While Nginx rewrite rules does similar things like Apache, there are still lot of differences in terms of how you write a rewrite rule in Nginx. Using rewrite, you can route many incoming original URL to a master controller template that will serve those request. The following rewrite example explains this. As you see above, any URL that has matches the pattern here (i.e /linux/ in the URL) will be served by linux.php, but the last portion in the original incoming URL will be used as an value for the distro argument in the linux.php controller. Similar to previous example, we are using $1 in the replacement string to capture anything that is inside the 1st parenthesis ( ) in the reg-ex. In this case, this is the last part of the original incoming URL. We are also using the last flag here to instruct nginx to stop search for further rewrite directives in the current-block and move-on to the next matching location for further search. In this example, we’ve placed the rewrite condition inside location directive. In this example, the location directive is /data/, which also matches the $1 in the replacement string given below. So, if you had “last” as the flag, after the initial rewrite of the URL, Nginx will typically look for the next rewrite directive for the new URL. In that case, Nginx will keep redirecting to the same location data and keep processing the same rewrite rule for maximum of 10 times, and finally it will return the 500 error code. Since, we don’t want the above behavior, we’ve used “break” as the flag here which will just stop processing the rewrite blocks any further. If a replacement string includes the new request arguments, the previous request arguments are appended after them. If you don’t want this behavior, putting a question mark at the end of a replacement string avoids having them appended. In the above example, when the replacement string include the incoming request arguments, then the arguments from the previous request are appended after them. Some times, you probably don’t want that append to happen. In that case, use ? as shown below. In the above example, replacement string include the incoming request arguments, then the arguments from the previous request are NOT appended after them. The following few examples illustrates that we can use rewrite inside the if directive. Please note that there are better ways to achieve the end-result of the above examples. The above examples are just given to show that we can add rewrite directive inside if statement in the nginx config file. 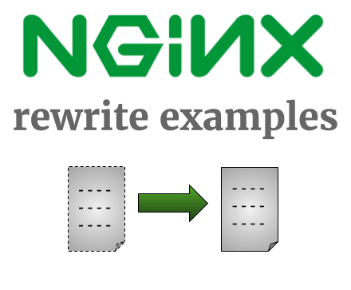 The following are the 4 different Nginx Rewrite directive flags that you can use. last: This flag will stop the processing of the rewrite directives in the current set, and will start at the new location that matches the changed URL. break: This flag will stop the processing of the rewrite directives in the current set. By default, anytime Nginx does successful rewrite, it doesn’t log it in the error.log. Initially when you are writing complex rewrite rules, you really want to make sure that Nginx is doing the rewrite as per your requirement. For this, you should enable the rewrite log, which will write a log entry anytime nginx does a successful rewrite using any one of the rewrite directive in the configuration file. For this, use the rewrite_log directive and set it to on. The first line indicates the location of the error_log file where we want to write the rewrite messages. Please note that a rewrite message is of type notice. So, you have to add “note” at the end of this line as shown above. rewrite_log on – This line enables logging of all the directives of ngx_http_rewrite_module modules to the error_log file. After the above change, you’ll started seeing lines like this which clearly shows which specific rewrite rule was used in translating the incoming URL. This also will show the final translated URL in the log entry.